This leotard features a moderate scoop front and back, and not lined. Machine wash cold, delicate cycle, hang dry. This great item is part of our, team basics, the winning choice for dance, costuming and team cheer. Soft, breathable fabric has excellent stretch at a value price. 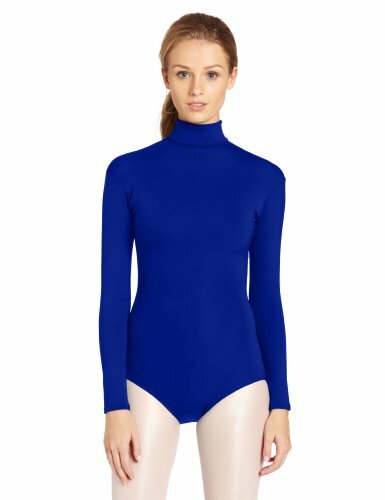 Capezio team basics adult turtleneck leotard. 90% nylon, 10% spandex. Zippered back. Not lined. Adult zip neck long sleeve leotard with roll down turleneck design. Ballet cut leg line, along with shelf bra lining. 90% nylon, 10% spandex. Soft, breathable, quick-drying. Fabric has excellent stretch. Machine wash cold, no bleach hang to dry. This great item is part of our, team basics, the winning choice for dance, costuming and team cheer. Soft, breathable fabric has excellent stretch at a value price. Full front lining on colors, ballet pink, light blue, light suntan, and white only. Capezio team basics adult halter leotard. Best seller. 90% nylon, 10% spandex. Straight front. U-back. Pulls on over the neck. Shelf bra lining on all colors. Also available in child sizes. Machine wash cold, delicate cycle, hang dry. This great item is part of our, team basics, the winning choice for dance, costuming and team cheer. Soft, breathable fabric has excellent stretch at a value price. Capezio cotton classics ideal for studio dress, and performance. A new cotton lycra spandex fabric offers better coverage with a soft hand and clean saturated color. Extensive wear testing and attention to detail assure perfect fitfort. Pinched front styling with body shaping princess seams. Colors, white, light blue and pink have full front lining. All other colors are shelf lined. 90% cotton, 10% lycra spandex. Scoop front and back. Ballet legline, all others feature self fabric shelf bra lining. Machine wash cold, delicate cycle, hang dry. Capezio cotton classics ideal for studio dress, and performance. A new cotton lycra spandex fabric offers better coverage with a soft hand and clean saturated color. Extensive wear testing and attention to detail assure perfect fitfort. Classic scoop neck front and back. Color white is fully front lined, black color has shelf bra linning. Zero Restriction Mens Airflow Half-Zip Wind Vests Size: XL. Color: Black. Gender: Male. Age Group: Adult. Material: Polyester blend. The newest member of the CB WeatherTec family is a classic full-zip jacket that is wind and water resistant, with front zippered pockets, a partial elastic waist, adjustable snap cuffs, back cape detail and inside locker loop. Tonal C&B logo at back neck. 100% polyester. Machine wash. Imported.